Bob-omb Reverse is a multiplayer Table minigame in New Super Mario Bros. The minigame is very similar to Reversi but this game is playable for more than two players and has a six-by-six board. The music played here is a cover of the Toad House and P Switch music from Super Mario Bros. 3. 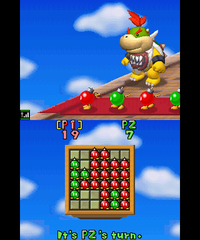 Bowser Jr. is on the top screen with Bob-ombs and a board of 6 x 6 squares is on the bottom. The game randomly chooses which player starts. Each player has to surround the Bob-ombs of his opponents by dropping a Bob-omb in the squares, each surrounded Bob-omb turns to the color of the player who played last. If all of someone's Bob-ombs are captured, they turn black and cannot win. The game automatically shows to the players which squares can be used for dropping Bob-ombs. If a player has no possibility, the game skips their turn. The game finishes when all squares are taken, or when there are no valid moves for any players. The player who has the most Bob-ombs wins. This page was last edited on December 3, 2018, at 02:15.